International bestselling Australian author Melissa Pouliot not only writes crime fiction, she also writes true life stories. 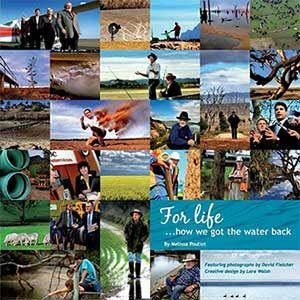 For Life…how we got the water back is a coffee table style book which tells the stories of the people behind the largest Australian water infrastructure project of its time. It is a piece of Australian history told through the eyes of the people who were there. Books tell the story and they bear witness for time, testimony for generations, lessons from the past. When these pipes wear out – when will that be anyone – they’ve got the template here on how to move the mountain and do something about it. This book’s a bit like a river, a metaphor for a winding journey, it’s all about confluence and influence and persistence and it leads to something mighty. Includes print and audio book, voiced by Sandra Moon and featuring songs by The Lazy Farmers Sons.